Dr. Melinda Dunlap, an Oklahoman and graduate of Broken Arrow High School, received a bachelor’s degree in chemistry from Hendrix College in Conway, Arkansas, and went on to complete a Ph.D. in organic chemistry at the University of Oklahoma. She attended medical school at the University of Arkansas Medical Sciences in Little Rock and completed a residency in internal medicine at the University of Texas, Southwestern (Parkland Hospital in Dallas, Texas). Dr. Dunlap is board certified by the American Board of Internal Medicine (ABIM) in internal medicine. She completed a fellowship in hematology and oncology at Vanderbilt University Medical Center in Nashville, Tennessee, and she is a member of the American Hematology Society and the American Society of Clinical Oncology. 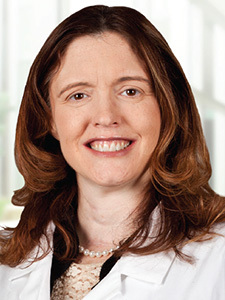 Dr. Dunlap is certified by MD Anderson Cancer Network®, a program of MD Anderson Cancer Center.